Vancouver, BC -- Aben Resources Ltd. (TSX-V: ABN) (OTCQB: ABNAF) (Frankfurt: E2L2) (the "Company") is pleased to report that assay results from the first drill hole of 2018 have been received with multiple high-grade zones and precious metal values intersected in the hole at shallow depths. Drill hole FK18-10 was collared in the North Boundary Zone of the Forrest Kerr Property in BC's Golden Triangle region where drilling late in the season in 2017 discovered strong precious and base metal mineralization. Hole FK18-10, the first of eight holes that have been drilled thus far, has four separate high-grade zones with the best zone returning and interval of 38.7 g/t Au over 10.0m including 62.4 g/t Au over 6.0m starting at 114 metres downhole. 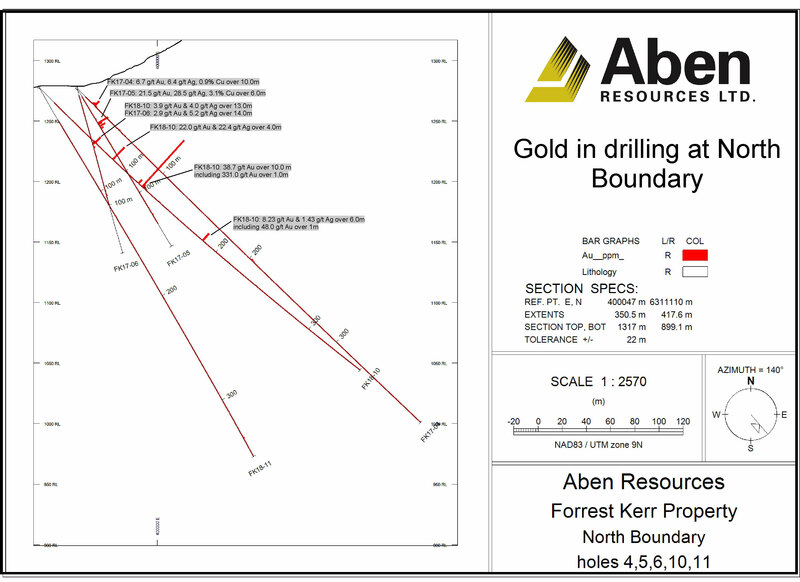 Jim Pettit, President and CEO of Aben Resources stated, "The high-grade gold and base metal values in the first hole of the 2018 drill program have far exceeded our expectations and confirm the presence of a robust and strong mineralizing system at the recently discovered North Boundary Zone. We are now looking at an area that extends 230m south to the historic high-grade Noranda drill hole from 1991 and although the geology is complex we believe more drilling will delineate additional high-grade mineralization. The target areas in and around the Boundary Zone are relatively shallow and continue to provide strong discovery potential as we look to value-add the project using a systematic exploration methodology. With drilling ongoing, the Company is awaiting assay results from an additional seven drill holes, all of which were drilled at the North Boundary Zone and will provide updates as results become available. I would like to congratulate our geological team on their work thus far as we have made a significant discovery in the Golden Triangle region that is still in its early days with drilling slated to ramp up over the coming months." Hole FK18-10 (140/-45) was drilled from a location 35 metres northwest and along section from the drill pad from which the discovery holes FK17-04, 05 and 06 were drilled late in the drill season last year in August/September. The new hole has further defined and significantly increased the zone of precious and base metal mineralization that the 2017 holes originally intersected. 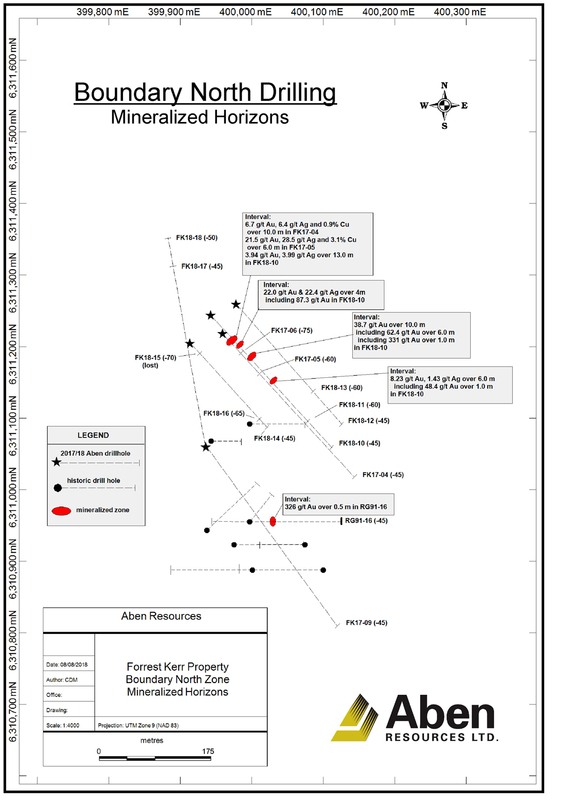 Of particular note, the high-grade interval of 331.0 g/t Au was encountered 230 metres north of a 326 g/t Au interval reported by Noranda in 1991 in drill hole RG91-16 (see attached plan map). High-grade intercepts are generally found in narrow and discrete zones of moderate mineralization within a broad envelope of lower grade mineralization. Mineralization at North Boundary reflects the poly-metallic nature of the core with widely variable values of Au, Ag, Cu, Pb and Zn throughout. With drilling currently ongoing, final geochemical assays results for seven completed holes are still pending and the Company will look to expand the scope of the program given the results from the first hole and visual indicators in the other holes. This recently discovered North Boundary Zone shows very little outcrop exposure and contains complex geology which is disrupted by a series of faults of unknown orientation. Additional drilling is required to determine true thicknesses and establish controls to the mineralization. Previously reported and select results from the few 2017 drill holes at North Boundary include 6.7 g/t Au, 6.4 g/t Ag and 0.9% Cu over 10.0m including 18.9 g/t Au, 16.6 g/t Ag and 2.2% Cu over 3.0m in hole FK17-04 which contributed to an average grade of 0.26 g/t Au over 387.0m. Hole FK17-05 returned 21.5 g/t Au, 28.5 g/t Ag and 3.1% Cu over 6.0m from the same zone at a slightly greater depth. All 1 or 2 metre drill core samples were delivered to ALS Global prep facility in Terrace, British Columbia where they were crushed until 70% passed a 2mm sieve, then a 250g split was pulverized until better than 85% passed a 75 micron screen. Gold was tested via fire assay method Au-ICP21 with all ore-grade samples (>10 g/t) undergoing fire assay with gravimetric finish. ALS performed multi-element ICP-AES package ME-ICP41 in their Vancouver facility to test for 35 other elements. In addition to the quality assurance and quality control program performed by ALS, Aben personnel insert lab certified standards, field blanks and duplicates into the sample stream at the rate of one QA/QC sample in every 10 samples. Aben Resources is a Canadian gold exploration company advancing projects in British Columbia's Golden Triangle, the Yukon and Saskatchewan. 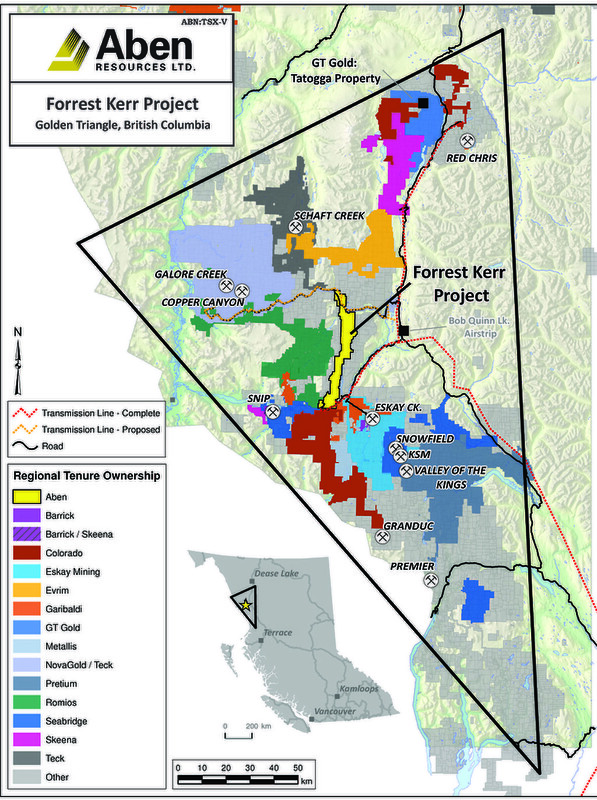 The Company is actively exploring its flagship and high-grade Forrest Kerr Project located in the Golden Triangle region where recent drilling has discovered strong precious and base metal mineralization at the North Boundary Zone. Aben Resources has approx. 81.5 million shares issued and outstanding.